Sometimes, winter can just feel so blah! Grey, black, and brown just start to feel like they are weighing on you. My favorite way to spice up an outfit is to pick skirts that pop. This skirt is filled with the perfect stripes and has a combination of color and neutral tones, which makes it really easy to pair with your winter colors. Today is Style Me Weekly! Are you excited?! 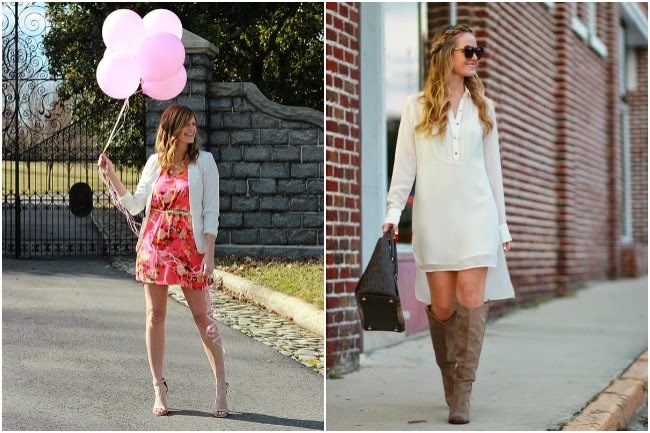 This week we are featuring some AWESOME bloggers with fabulous style! Be sure to check out there blogs for more fun! You look absolutely stunning. You are rocking that skirt and I absolutely LOVE your shoes! That is a really cute outfit. I am loving those boots you are sporting. Very cute indeed. Now that's a sharp looking outfit. You wear it well! Beautiful outfit. I seriously need you to come buy all my clothed, pick them out for me and style me! Honestly, you have talent and an amazing eye! I love grey and burgundy together!! And I absolutely LOVE ankle boots…I have 4 pairs! The skirt looks so great with the boots! I'm loving this new look on you! I really like those ankle boots and the pop of the burgundy is so smart looking. Love, love, love this outfit! I want it! Adorable! I love your sense of style. Thanks so much for sharing! That skirt is the perfect amount of winter right there. The colors, the length, and from the looks of it, the weight of the fabric. Perfect with booties like the way you styled it! Love the skirt so much. I would love to own that skirt. It looks so comfy yet stylish as well. Those booties though! Always love your OOTD's! Those boots are the bomb! I've been looking for something similar but I really want those with sturdy heels so I can walk on them for long without feeling much uncomfortable. Ow I really love your boots!! You're look gorgeous you're so pretty in your outfit!! Really nice. The color combination looks good on you. Love the stripes. And those booties! Love 'em too! You look so stylish! Very pretty! You have the most amazing wardrobe! You always look so put together, I am a disaster! Love that look! The boots look great on you! yowza! you look amazing! that is a very attractive outfit! Yes. All of it yes. Ok, maybe not the shoes because I just can't wear heals but I love this dress and jacket. Looks comfy and a dress I would actually not feel silly wearing. I'm way into your clutch! Looks like a comfy outfit but also stylish. LOVE IT! Very nice! That entire outfit is hot, and you are totally rockin' it. Love the coordination, and even the boots, which don't even usually appeal to me. Love this outfit! And those booties! I die! Such a great post and I am glad to see this link up! Okay, I'm seriously loving your outfit and those booties are PERFECT! My wife would really like the boots. She has a great love for shoes and boots. Love this whole look. Great colors and the boots are awesome! Major outfit envy right now! Love the color combo and your hair is looking gorgeous per usual. I love your curls and your hair color! totally off topic but whenever I visit your blog, that's one of the first few things I noticed! Anyways, I love the matching of the colors on your dress and the coat is really nice! It's one of the few coats that I would gladly buy! That is a really cute winter outfit. I like the pop of color on the skirt. Your hair is so lovely, I am loving those loose curls. Your outfit is stunning too. Loving the stripey dress and the boots. It would be hard to pick just one outfit. There are so many that really go with my style that I would love to have. You look very nice in that outfit, and you look to be having a great time as well! I love the stripes. The colors are just perfect together. More people should wear stripes! jacket combo! The boots too!!! This is such a cute outfit, you look really beautiful wearing it! Very nice outfit. Love those little black boots. Not sure how I would look in them but they do look nice. I love the dark grey-black shades. It's a very chic year-around look. Okay, just stop being gorgeous already! Geeze! I love that skirt, and your shoes seriously pull it all together. Love, love, love! I do have to say – this is one of my favorites that you've shared! Now I have to look for similar shoes! You wear it well! You look great love the look of that dress, I also love your coat and the clutch bag. This is a cool link-up next time will remember to look for it. I love your jacket and your shoes. I'm not a big fan of horizontal stripes because my hips are too wide for it! But I'm jealous of anyone that can pull that off! I absolutely love the overall look and colors of your outfit. And especially those shoes. This is such a great look. One of my favorite looks that I've seen yet! I love this and it looks wonderful on you. This outfit looks amazing on you. I would love to wear it. I love the boots. Ahhhh I absolutely love everything to do with this striped outfit. And, you look really good in grey. This is something that I would wear. I really need to find me a pair of booties that fit my style. This may very well be one of my favorite outfits you have shared here. I just love that coat and that stripped skirt. It looks almost like old sweatshirt. So cute. You look great in this outfit! I really need a wardrobe makeover. Thanks for the motivation! I love the contrast between the maroon and the grey. It looks so beautiful on you. Totally love this entire outfit! I'd wear it! I am in love with this look – and as always you look amazing in it! This outfit looks so professional and causal at the same time. A great look. Better not let my wife see this. We already need separate housing for shoes. Great looking outfit though. Oh goodness, this outfit is just too perfect! I keep saying it but it's so true, I need someone like you to help me pick out clothes, lol!